“The Women & Hi Tech Board of Directors and Directors Emeritus consist of some of the brightest women in business and technology in Indianapolis, " said Tiffany White, President of Women & Hi Tech. "Because of their hard work and dedication as an all-volunteer board, Women & Hi Tech continues to grow and serve women interested in technology in Indiana." View a full list of the Board of Directors and Directors Emeritus. Purchase your ticket today for The Leading light Awards at the Indiana Roof Ballroom on October 6, 2016. Women & Hi Tech is pleased to announce the call for nominations for the 2016 Leading Light Awards. The Leading Light Awards recognize women of achievement in science, technology, engineering, and math who have set an example to others by demonstrating expertise, professionalism, leadership, service, courage and tenacity in pursuing their chosen career. This year, there are seven Leading Light Awards being presented during this prestigious event at the Indiana Roof Ballroom on October 6, 2016. Nominations are being accepted now thru July 29, 2016. For details about each award and to nominate an outstanding female, please visit https://womenandhitech.wildapricot.org/2016-LLA-Nominations. Women & Hi Tech is in need of volunteers to support the Indiana State Museum Bicentennial Expo on Saturday, May 21st from 10 am to 5 pm. The event will be held outdoors under a tent, RAIN or SHINE. Tables and chairs will be provided. As a volunteer, you will be assisting younger children with a DNA bracelet activity. Beads, pipe cleaners and instructions will be provided. With thanks to our outstanding sponsors, Women & Hi Tech is honored to provide two $5,000 scholarships this year. The scholarships (one undergraduate and one graduate) will be awarded to women living in Indiana with plans to remain here after graduation to put their education to work in our community. The Women & Hi Tech Scholarships are open to women pursuing an undergraduate or graduate degree in science, technology, engineering or math. 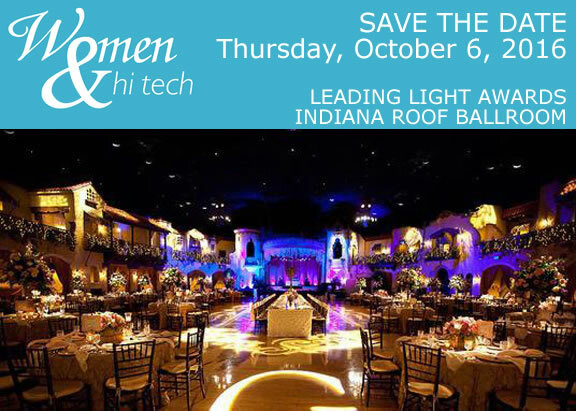 The two recipients will be honored at the Women & Hi Tech Leading Light Awards on October 6, 2016 at the Indiana Roof Ballroom. The 2016 Leading Light Awards will be held Thursday, October 6, 2016 at the Indiana Roof Ballroom. Save the date and stay tuned for more information.